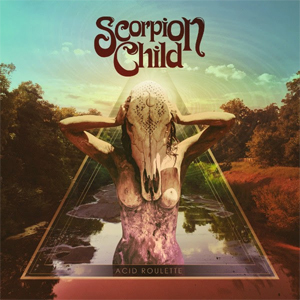 Texan classic rockers SCORPION CHILD will release their second album, Acid Roulette, on June 10, 2016 via Nuclear Blast Entertainment. Once again, the band recorded at The Bubble in Austin, TX with Chris ‘Frenchie’ Smith (THE ANSWER, AND YOU WILL KNOW US BY THE TRAIL OF DEAD...) who produced and arranged the band’s self-titled, first full-length. Acid Roulette was mixed by Dave Schiffman. The album's artwork, pictured above, was a collaboration by Aryn Jonathan Black, photographer Max Taylor and graphic designer Rob Kimura. Today, SCORPION CHILD kicks off their European trek as support for the legendary space rock icons MONSTER MAGNET! Commented Aryn Jonathan Black: "MONSTER MAGNET are an amazing band! We can't wait to share the stage with them. We will be performing a great deal of new material that will be featured on the new album that's due out this summer! Can this tour hurry up and begin already??"